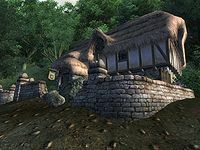 The Imperial Bridge Inn is an inn east of the Yellow Road, east across the Niben Bay from Bravil (quest-related). It is found on the northern bank of the Silverfish River, just east of where there is a wooden bridge across the river, so that it can be easily reached from either bank. The publican, Davela Hlaren, offers advanced Hand to Hand training. She rents rooms for 10 gold per night. She will also buy potions and food, while selling only the latter. Regulars include a stationed Imperial Legion Soldier and the Altmer sorcerer Lithnilian. He has lost his research notes in a nearby cave and needs someone to recover them. They are joined by Mirisa after her related quest has been completed. The ground floor contains the reception area consisting of a small bar with an engraved counter and a dining room while a larger sitting room can be found on the second floor and the rooms on the third. The top floor is the attic, with a few floorboards making up the flooring and all of the three beds together, as there are no individual rooms. You are free to sleep only in the first two beds, as the last is owned by Lithnilian. Of particular interest are two books: the skill book Calcinator Treatise (an Alchemy skill book), which can be found sticking out from beneath Lithnilian's bed, and the rare Hanging Gardens, in a stack of tomes on a nearby chest of drawers. 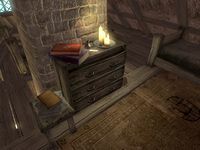 No Stone Unturned: Help an Altmer Sorcerer at the Imperial Bridge Inn recover his research notes. Davela Hlaren will rent the bed even if you don't have the 10 gold necessary for a room; she will still unlock the door and allow you to sleep in the 'rented' bed. Esta página foi modificada pela última vez à(s) 22h12min de 4 de setembro de 2015.